By the early 1800s, Appleby Magna parish church was thought to be in serious need of restoration and renewal. The first proposals for restoration involved repairing the roofs and shell of the building and renewing the seating. The project occupied the time and patience of many people from 1822, when the Vestry Meeting first decided to restore the church. As related in this article, the project came to a halt in 1827. Eventually resumed in 1829, it was completed in 1832 and the last bills paid in 1835. The building had had two lives already, first as the home of 'Catholic' worship in the medieval period and then, after the Reformation, as a 'Protestant Preaching Box'. Later in the 19th century, it was to change again in line with the ebbing tide of religious sentiment which was turning back towards a more ceremonial form of worship. Victorian country clergy were not immune to changing ideas about church services or adapting the building interior to accommodate these. As a result, restoration of the chancel was undertaken in 1870-71. By 1900, the building had been reordered and adorned in a High Church style, acquiring the layout and most of the fittings which it has today. The Rector of Appleby in 1822 was Revd Thomas Jones MA. At the time of his appointment in 1793, he had “long been resident curate” so he knew the church and village well (1). The patron of Appleby church in 1822 was Mr Edward Dawson of Whatton House, Long Whatton near Loughborough (2). However, the village was dominated by the Moore family who had three substantial houses on their Appleby estate (3). Squire George Moore (aged 43 years) lived at SNARESTONE LODGE with his son George (10) and daughter Susan (9), and his second wife Elizabeth (39) (4). At the WHITE HOUSE, lived the squire's widowed mother, Mrs George Moore (Elizabeth, 68), with her daughters the Misses Moore: Catherine (47), Elizabeth 46) and Mary (44); and sons John (37) and Charles (34), all unmarried (5). At APPLEBY HOUSE (later to become APPLEBY HALL) lived Mrs John Moore (Mary, 65, died 1823) widow of Revd John Moore (died 1814) and aunt by marriage to the squire. They had no surviving children (6). All of these people had an interest in the village church and several of them took an active role in furthering its restoration. The deaths of two of the main characters may have contributed to the delay in completing the first phase of the project. Charles Moore the squire's youngest brother died in March 1827 followed in June 1827 by the squire George Moore himself. His successor as squire, George junior, was not yet 16 years old. 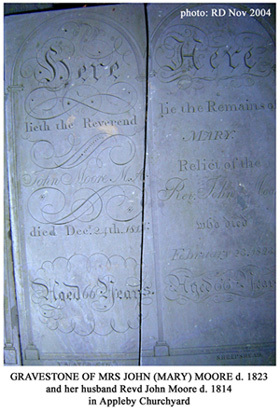 Rector Jones died in August 1830 during the actual reconstruction work. His replacement Revd John Echalaz MA was appointed by the young squire's guardians. After coming of age, in September 1832, the squire purchased the advowson (church patronage) outright from Edward Dawson (7). In a major work of restoration in the 1820s, as today, it was necessary to engage the services of professional men conversant with the type of work involved. An architect was required to prepare suitable plans and experienced men from established firms in the building industry were needed to supervise and carry out the work. The diocese or archdeaconry had also to be consulted. Then as now a faculty had to be obtained from the church authorities to authorise the work planned. This was, and still is, the ecclesiastical equivalent of planning permission. If it is your wish to know what is to be done to Appleby Church ...The church is in a bad state throughout and it is proposed to put a new roof on .... The population of Appleby is between Eleven and Twelve Hundred .... We have had some eminent architects to view the Church and to give opinions for our guidance.... We have received tenders from different builders and the Parish have fixed on Mr Robinson of Derby to do all the work by contract. The total expense will be about Two Thousand One Hundred Pounds. To meet this sum the late Mrs John Moore ... left in her will One Thousand Pounds. Mr Jones also reported that the Governors of the School had agreed to meet the cost of £130 for rebuilding their gallery at the west end of the church. A further letter dated 29 January informed Mr Dawson that plans of the project were being sent to him by coach (8). 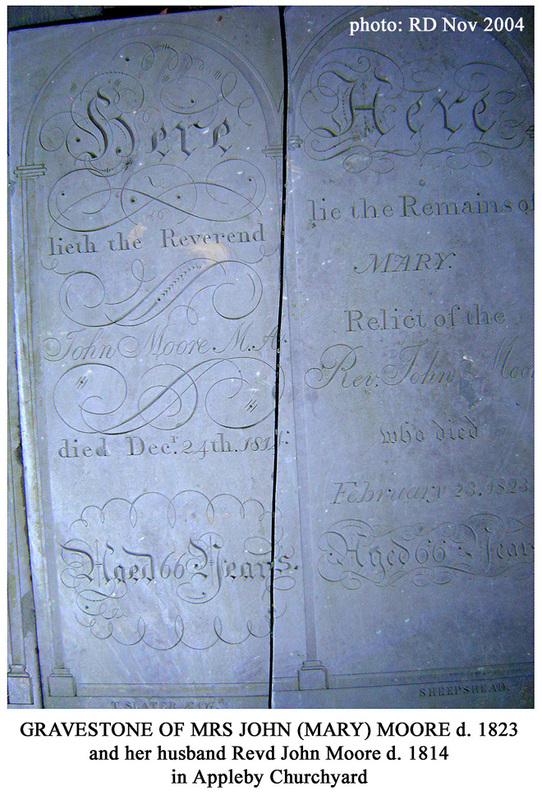 However first steps to start restoration work had been taken as early as 1822, before Mrs Moore died. In the letter to Mr Dawson quoted above, Rector Jones refers to eminent architects and different builders - both in the plural. Even allowing for an element of competitive tendering, the process by which the rector and wardens arrived at the final choice of professional men was haphazard to say the least. Changing both architect and builder, and making major alterations to the plans at an advanced stage in the project, must have delayed completion as well as adding to the cost and forcing economies in the later stages. The first architect consulted was Joseph Potter of Lichfield, who submitted an estimate for 'repairs' as early as October 1822. On 18 April 1823 he wrote to Rector Jones about the pewing; later there were discussions about the cost of each sitting. From the same period (although undated) there is Potter's 'Specification for new pewing and putting in new galleries'. This also stipulated 'the floors of the aisles to be laid with Yorkshire stone, the Gravestones being first laid down in the places where they now occupy, and the stone paving made good to them'. The School gallery was to be taken down and rebuilt with a reduced depth 'to fall in straight with the other galleries'. New pews were to be constructed throughout and nearly all the joinery was to be undertaken using oak. It was also required to 'enclose the arch at the east end of the north aisle with a Brick wall and put in a new moulded door two inches thick .. and plaster the new wall'. Clearly this wall was never built, although a vestry was later formed in the old chapel. The arch behind the balcony leading to the belfry was also to be bricked off and plastered over. On May 17 (probably 1823) Potter wrote to Charles Moore, nephew and executor of Mrs Moore, to report that drawings were completed (9). Joseph Potter was a capable and recognised architect with other projects in hand so, even if the scale of the work was suddenly increased, it is difficult to understand why, after all this preparatory work, the church officials found it necessary to replace him (10). The replacement architect was John Mason of Derby and his name appears in Appleby correspondence from 1825 (11). Mason seems to have been brought into the work initially to provide a quotation for work not being undertaken by Potter. Although undated, there is a reference to Potter's estimate for 'repairs' and Mason's estimate which includes work on the doors and ceiling of the south porch. Mason sent Rector Jones a work specification on 31 July 1825. The next stage was to prepare plans but on 2 Jan 1826 Mason wrote to Charles Moore regretting the delay in sending plans due to illness (12). The plans were needed for approval, firstly by the patron, the rector and the parish at Appleby but, more importantly, by the Diocesan authorities in the form of the Archdeaconry Court at Leicester. The key person at Leicester was Mr John Stockdale Hardy, Attorney and Registrar of the Archdeaconry Court, who would prepare the faculty based on the plans drawn up by the architect (13). The plans must have materialised during 1826 because Stockdale Hardy, on 14 September 1826, wrote to the rector that he had 'received plans from Mason but there is no court at present' . Then in February 1827 there were other problems. First Stockdale Hardy wrote on 23 February that he regretted 'not having had the plans from Mason in time for the court'. (I suggest that this apparent contradiction can be explained by a revision of the plans between the two dates.) Then, when Stockdale Hardy finally got the plans before the court he wrote to Rector Jones 'I could not get the faculty business through ...owing to questions being put by the court which only the architect could answer. I have therefore written to Mr Mason to attend Monday next....' There may well have been another awkward question as Stockdale Hardy continued 'Pray is the Patron Mr Dawson aware of the Alterations?' (14). Precisely when Mr Dawson was consulted is not clear, but in an undated letter to Rector Jones he comments that the plans are 'particularly good' but suggests that the pulpit be placed in the centre of the nave. This suggestion, harking back to an arrangement preferred in the 18th century, was not taken up (15). The tough stance taken by the Consistory Court led to some apprehension at Appleby. An anonymous letter, almost certainly written by the Rector, to John Mason Clerk of Works at New Goal [sic] Derby on 4 March 1827 is astonishing in encouraging dissembling. He was afraid that the court would question the inadequate provision of free seats. The court members might spot that any seats in the galleries not earmarked for the school would be required by the singers. 'I am afraid many free seats will not be obtained in that quarter ... perhaps the court will not say anything ... this is a confidential letter to you and you must show it to no-one'. Mr Mason was being encouraged to tell the truth, but not the whole truth (16). With a small alteration required by the court, Stockdale Hardy was eventually able to report that the faculty was signed and sealed in late March or early April. Mason advised the Rector not to sign any contract until the faculty was under seal. The Rector responded on 7 April by asking to see the faculty before holding a Parish Meeting (17). Another unsigned letter to Mason, written by the same hand one month later, on 9 April, shows the Rector questioning to what degree the parish was bound by the wording of the faculty approved by the court. He was beginning to realise perhaps that a faculty 'under seal' was a legally binding document. 'We wish you and Mr Robinson to consider ... are we obliged by the Court at Leicester to cover the whole roof with lead? ... I suppose you can ascertain this point by the papers you have with you at Derby' (18). The Rector's attitude in this matter and in apparently wishing to conceal the shortage of free seating points to lack of adequate funds. Free seats do not bring in any rental and lead is an expensive material with which to cover the whole roof. The Parish Meeting must have been a way of addressing the problem. As well as gaining enthusiasm for the ambitious project, the meeting could be expected to generate financial support too, which is what indeed did happen. At this date such an appeal for public support was unusual (19). 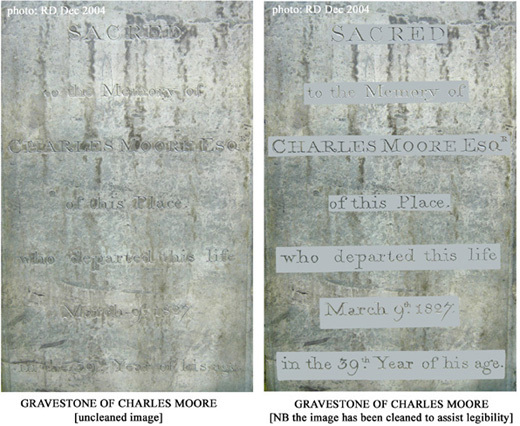 Charles Moore, the Squire's youngest brother, represented the Moore family in church restoration discussions. In particular, he controlled his Aunt's generous bequest of £1000 towards the scheme. He died suddenly, at the age of only 39 years, on 9 March 1827 during the final stages of the faculty negotiations. John Stockdale Hardy writing to the Rector on 22 March expressed his shock at hearing the news. The squire's letter to the rector of 18 April indicates that he promptly filled the gap left by his brother's demise. Then the squire himself died on 25 June 1827 (20). Subsequently, the family interest was cared for by local solicitors, probably Dewes and Fisher of Ashby who were already acting for the Rector (21). Following the consultation with John Mason of Derby as architect, it is not surprising to find a Derby builder being asked to provide quotations for the work. This was Anthony Robinson of 26 King Street, Derby, listed in Pigot's Commercial Directory for 1828-29. His name first appears in a letter from Mason to Rector Jones on 10 March 1826 and on 25 June he was asked to give details about a part estimate of £83‑10‑0. There also survives from this period an undated tender from Robinson for £1875‑2‑0 (22). Other competitive estimates were requested in early April 1826 from William Ward of Walsall, T Glover (unknown location) and William Patterson of Nottingham. Ward estimated £1825-11-8 but then declined to tender. Nothing apparently came of the others (23). In his letter to Mr Dawson written on 9 January 1827 the Rector had written: 'We have received tenders from different builders and the Parish have fixed on Mr Robinson of Derby to do all the work by contract. The total expense will be about Two Thousand One Hundred Pounds'. So it appears that by that date there was a firm understanding that Robinson would be contracted to carry out the whole job (24). During April and May 1827, planning and estimating continued apace. There survives an undated specification from Robinson with £1675 written on the back; also on 14 April he sent Rector Jones a revised tender for £2148-2-0 (25). On 23 April 1827 at the rector's request Mason sent his professional terms for the commission. These were 5% for all working and finished drawings, an extra £28 for the faculty drawing and 2 guineas per day travel expenses. To this he added an encouraging note: 'NB I feel happy in saying we are likely to have the church finished sooner than expected - in conversation with Mr Robinson I find he is likely to have a quantity of oak to commence with ....' The following day Robinson wrote to William Dewes the Rector's solicitor offering named referees as security and on 26th April Dewes reported this to the rector (26). However during the following month there were further proposals and alterations to Robinson's estimate (sent to Dewes) including 'extra items which raise it to £1952-2-0'. This was followed, on 30 May, by a new contract (sent to the Rector) for this latest sum. Confusingly this estimate is less than the quotation given a month earlier (27). On 1 June, William Matthews a carpenter and joiner from Ashby de la Zouch wrote to Robinson, presumably at the instigation of William Dewes, querying the latest specification and the costing of the latest alterations to the original plan. On 5 June Dewes wrote to the Rector that he had Robinson's reply and expressed his dissatisfaction. On the back of this letter was a copy of Robinson's answer: he had declined to give particulars of the costing in detail (28). And that appears to have ended Robinson's involvement with the project. About the same time, Mason received a letter from William Dewes reporting that the rector had said that Mason's charges 'were more than the parish were willing to give'. How, or whether, this impasse was resolved is not clear, but from this point there are no more records of correspondence for almost two years (29). Why did the contract negotiations break down? Were the rector and his solicitor having doubts about Robinson's competence or was it simply that the whole project was getting out of hand and the cost was escalating beyond the parish's pocket? The rector had taken every opportunity to question Robinson's costing. The last indignity for Robinson must have been when another contractor (Matthews) was brought in to query the details - and he refused to co-operate any further. The rector's desire to minimize free seating and to avoid, if possible, all lead for the roofing, taken with repeated questioning of Robinson's costs, all point to uncertainty about the project's finance. The critical factor may well have been the recent deaths of the squire and his younger brother. Without firm backing from the Moores, the rector may have felt unable to proceed. It was almost two years before things started moving again. The next document to survive is a contract with the same William Matthews of Ashby dated 6 April 1829 (30). We will look at the successful restoration project which followed in the next article. In these notes, APR = Appleby Parish Records, Leicestershire Record Office, Reference 15D55. For example 'APR 26/4' means Leicestershire Record Office Ref. 15D55/26/4. 1. Nichols op cit, p 436. Mr Jones's immediate predecessor Revd John Clements who obtained the living in 1778 was also Vicar of Colwich in Staffordshire and Rector of Long Whatton. He died in 1793 at Worcester. Although such 'pluralism' - accruing income by holding more then one living simultaneously - was permitted, conscientious rectors employed resident curates in their additional parishes, as was clearly the case here. See also: J H Pruett, The Parish Clergy under the Later Stuarts: The Leicestershire Experience, University of Illinois, 1978, pp132-3. 3 For the development of the Moores' estate and houses, see In Focus 13, The Heyday of the Moores at Appleby, 1751-1871. 4. Squire George Moore (1778-1827) lived at Snarestone Lodgewith his second wife Elizabeth (née Hurt, 1783-1841) and with his son George (1811-71) and daughter Susan Drummond Moore, named after her mother the squire's first wife (née Drummond), who had died shortly after her birth. 5. The squire had inherited the estate in 1813 from his father, also George (1743-1813), who had lived at the White House just north of Appleby off Measham Road. At the White House in 1822 lived his widowed mother, Mrs George Moore (Elizabeth née Darker, 1754-1834), with her unmarried children Catherine (Jan 1775-1863), Elizabeth (Dec 1775-1869), Mary (1777-1848), John (1784-1860) and Charles (1787-1827). Another son Thomas (1783-1852) married Elizabeth Webb Edge at Strelley in Nottinghamshire; he became High Sheriff there. 6. In 1822 at Appleby House, the third residence which was later to become Appleby Hall, lived Mrs John Moore (Mary née Hurt, 1757-1823) widow of Revd John Moore (1749-1814) and aunt by marriage to the squire. Their only daughter died in infancy. Mrs Moore was also the squire's sister-in-law, her sister Elizabeth being his second wife. 7. Revd J M Echalaz was appointed rector following Mr Jones's death in 1831 by the guardians of the young squire George Moore who had bought that 'turn of presentation' from Mr Edward Dawson. Mr Moore seems to have purchased the advowson outright soon after he came of age in September 1832. See S Glover (2. above) and J Pigot, Commercial Directory of Leicestershire, 1835. Nichols (p 435) gives the earlier history of the living. 10. Joseph Potter (c.1797-1875) architect of Lichfield, father Joseph Potter. Source: H M Colvin, A Biographical Dictionary of British Architects 1600-1840, 1995 quoted by www.churchplansonline.org . Potter's contemporary work (all in Staffordshire) included Christ Church, Burntwood (1818-26), St Michael Penkridge (1830-32) and St Peter Shenstone (1841-43). Potter, of St John Street Lichfield, is also listed in Pigot's Commercial Directory of Staffordshire, 1835. 11. John Mason (1794-1847) Architect, Derby, son of John Mason. Source: Colvin (as 10.above). Mason was also working at St Michael Derby (1824-38), All Saints Ockbrook (1834-35), Christ Church Hulland (1835-37), St Mary Magdalene Stoke Canon (1835-37) and St Peter Chellaston (1840-42). Pigot's Derbyshire Directory, 1828-29, lists John Mason as Land Agent and Surveyor at 8 Jury Street, Derby, the address used in the architect's correspondence to Appleby. One explanation for the difference in occupation could be that the John Mason listed was the architect's father. 13. Pigot's Commercial Directory for Leicestershire , 1835, lists John Stockdale Hardy as an attorney and notary and registrar of the archdeaconry court of Leicester and his premises were in Friar Lane. The ancient Diocese of Lincoln was so vast that its archdeaconries had long had the authority to run their own affairs. Consequently, parish records were kept at Leicester rather than Lincoln. In 1927 the archdeaconry became the Diocese of Leicester, with St Martin's as the Cathedral Church.